Another great headset from LucidSound. Even though they’ve been around for a few years, there’s a chance this might be the first time you’ve heard their name, but they are a company to keep an eye on as they’ve been releasing a solid collection of gaming headsets like the LS35X IGN reviewed last year. Its new LS41 headset is a wireless 7.1 model primarily designed for the PS4, but it’s usable on all gaming platforms. At $200 it’s competing with other high-end wireless headsets like the Razer Nari Ultimate and Alienware’s AW988 headset, so let’s see what it brings to the table. The LS41 is LucidSound’s new flagship model, and it doesn’t need any flashy LED lighting to grab your attention. The overall look is quite understated for the gaming market and they look practically identical to the LS40, save for silver stitching instead of red on the ear cups and headband. The majority of the headphones are black with a silver metal ear cup frame. The ear cup and headband padding is cushy and the clamping force was comfortable for my head. At 355g the LS41 are middle of the road for weight and I didn’t encounter any neck fatigue or headaches from multiple hours of gaming. They’re 55g heavier than the HyperX Cloud Flight and about 50g lighter than LucidSound’s Xbox One headset, the LS35X. The cap of each ear cup acts as a scroll wheel and as a button. On one side the wheel controls the game volume while the button mutes the game sound completely. The other side adjusts your mic mix and mutes the microphone. When your mic is muted, a red LED lights up at the end of the removable mic boom. When it’s illuminated in a dark room it is a bit bright and I would usually move it out of my eye’s view as it’s quite distracting. On the bottom of the right ear cup is an EQ button that cycles through different presets. When receiving a stereo signal, the EQ cycles between different stereo width options. For surround signals, you can switch between stereo and surround. In order to use the headset wirelessly, there’s a USB base station that connects to your console or computer. An included optical cable then runs from the base station to the optical out on the console. After some menu adjustments that aren’t always the most intuitive choices due to the optical connection, you’re all set. The LS41 is designed primarily to work with the PS4, and when connected you get completely wireless functionality, including chat. The setup process is straightforward with a couple quick menu adjustments to get it working. To use chat on the Xbox One you’ll need to use the included 3.5mm cable to connect the headset to your controller. Using it with a PC is a bit more tricky. The headset can be used with either USB – although it disables the built-in DTS Headphone: X surround sound and instead uses Dolby Atmos or Sonic – or the base station with an optical cable. The exact surround setup will depend on your sound card. Chat settings need to be set within your preferred chat client (I used it with Discord). Luckily there are some great set up instructions on the LucidSound website that are easy to follow. The LS41 is designed primarily to work with the PS4, and when connected you get completely wireless functionality, including chat. The LS41 comes with all the cable connections you’ll need. In addition to the base station, optical cable, and boom mic, there’s a USB charging cable, a 3.5mm cable for Xbox chat and mobile device use, and a mic port cover in case you want to cover the hole when not using the boom mic. All of this can be carried in the included carrying bag which has an internal Velcro pocket to keep all of the various accoutrements tidy. If you’re using the LS41 with your phone, there’s a built-in mic for taking calls or using your voice assistant without having to have the boom mic connected. Sound quality on the other end of your call is clear with a little bit of extra room noise, but my callers didn’t find it distracting or difficult to hear me in any way. It had been a while since I ran around in the world of Horizon Zero Dawn on PS4. With the LS41 it was a welcome return, and setup took less than a minute. The surround mode with the headset gave great depth to the world around Aloy and I could hear the machines pacing around me as I hid in some bushes waiting for the right moment to strike. Being completely wireless is extremely freeing as I tend to contort my body as I dodge – usually unsuccessfully – left and right. On wired headsets it causes the cable to bounce off my arms or chest, so it was nice not having to deal with that distraction. To test out chat I switched over to the Xbox One for some high-seas sailing in Sea of Thieves. My crew commented on how clean I sounded in their ears. It was nice to be able to adjust the balance between the game sound and chat audio separately using the volume wheels on each ear cup. I also took this moment to try a second surround setting by pressing the EQ button that called up a setting named Boosted Surround. It seemed to add a bit more rumble to the low end and accentuated the cannon fire while trying to sink a skeleton galleon. PC setup takes more steps to get working properly, but once it’s ready the LS41 functions well. PC setup takes more steps to get working properly, but once it’s ready the LS41 functions well. I tried Battlefront II with both a USB connection using Windows Sonic and the base station using the DTS Headphone: X. I far preferred the spatial placement with the base station connection. It felt like there was more depth in the action around me. The overall sound frequency balance of the LucidSound LS41 is very good. There’s nice supportive bass that doesn’t blow out the mids and a good forward presence in the male vocal range. It does sound like there’s a bit of a dip somewhere around 500-700Hz, which affects the presence and clarity of female voices. The high-end can sometimes be a tad sibilant, but mostly it just caught my attention. Those high frequencies aren’t piercing at all. As far as battery life goes, I bounced around between various gaming platforms over the course of a few days and I didn’t need to recharge them until the end of the third day – I’d estimate around 16 hours into my playing time. They’re rated for up to 20 hours, so 16 hours jumping between wireless and wired, chat and chat-less is pretty good. The LucidSound LS41 has an MSRP of $199.99 and it’s the same price on Amazon. The LucidSound LS41 is an excellent overall gaming headset. 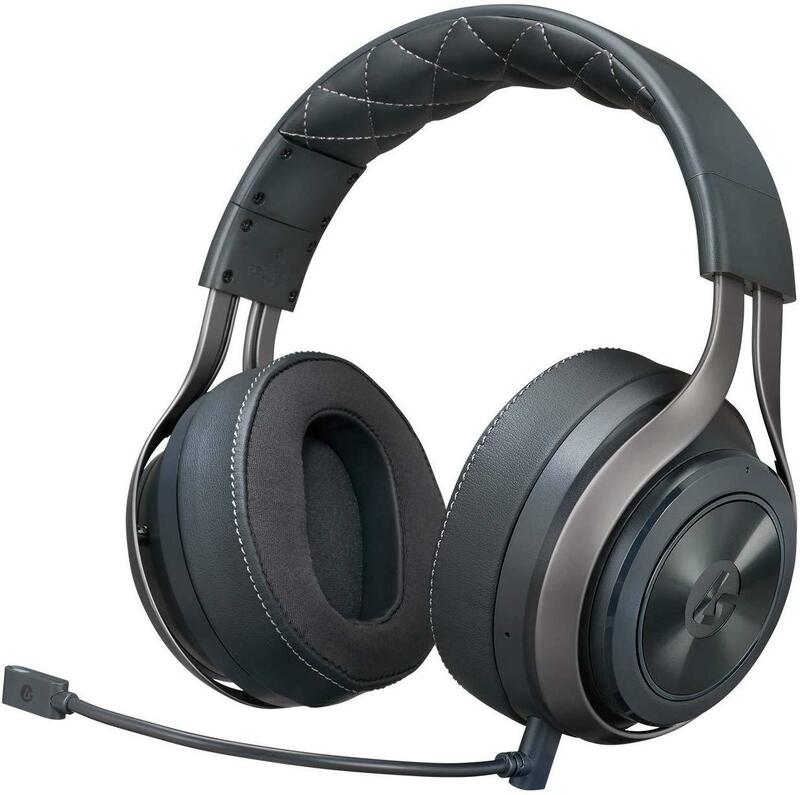 Although it’s primarily designed for the PS4 – and it does have the best functionality on that platform – the LS41 is a great Xbox and PC headset as well. At $200 they’re pricey, but given their great sound quality and usability on all platforms it’s worth it.